Expense fraud can start with fudging the taxi receipt. It can grow to writing in a larger tip amount than what was actually left on the table. It can snowball into falsifying receipts. Maybe it’s just starts small because “nobody will notice.” Perhaps one disgruntled employee can start chipping away at their frustration by getting the company back one expense report at a time. Or maybe a pair of executives can devise a more elaborate plan. How can you stop expense fraud from happening in the first place? This executive whitepaper outlines 10 safeguards you can implement today. So many occasions of expense fraud can be entirely avoided and caught early by implementing a Travel and Expense Management solution. Not only does the system communicate and enforce your travel and expense policies, but it also helps enforce them with built-in security features. This helps eliminate much of the manual work your AP team is doing at the end of the month and quarter so they can focus on more strategic initiatives. 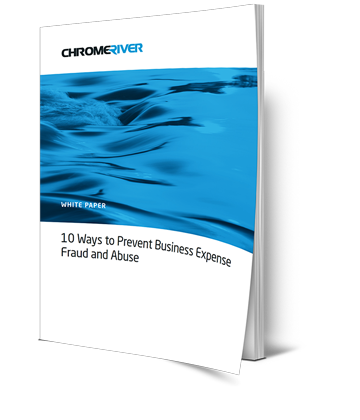 Download the whitepaper using the form to the right and see if the findings match up with your organization's concerns about expense fraud. And when you're ready to learn more, we're here to help. There's only one thing to say with Chrome River on your side - Take me to The River!